Armbands are traditionally worn around the bicep and sometimes mark the wearer as a member of a tribe, club or organization. Belly dancers often wear arm bands as additional body decorations during performances. Do you like the concept of wearing armbands but can never find one with the right fit? Below we are going to look at a few different types of armbands that you can easily make and decorate. 1. Measure the ribbon to fit around your arm and cut it to length. 2. Fold the ends under and stitch together. 3. Sew a short length of elastic onto one end of the ribbon. Loop the ribbon over and sew the other ribbon end to the other end of the elastic. 1. Obtain a yard of inch wide ribbon and 12-15 inches of half inch wide elastic (foldover elastic works well too). 2. Wrap the elastic around your arm and cut to length. 3. Sew the ribbon to the length of elastic, stretching the elastic as you go. When you release the stretch, the ribbon will bunch up along the length of the elastic. 4. Overlap the ends of the elastic and stitch them together in a flat seam. 1. Cut elastic about ¼” larger than your arm measurements. 2. Overlap ends ½” stitch by hand or machine. The band should be snug, but still comfortable. 3. Draw the shape of the armband on paper, making it 1 ¼” longer than your arm measurement. Leave an extra ¼ to ½” on the top and bottom for the seam. 4. Pin pattern on fabric and cut leaving an additional ½”. 5. Pin pattern on interface and cut exact measurement. 6. Fold seam allowances under the top and bottom edges and stitch through all layers. 7. Using the same pattern, cut and glue or stitch a piece of felt to the back of the armband. 8. Finish by neatly seaming the armband and adding decorations. 1. Measure where you wish to wear the band and add about 10” to that when you cut the copper wire. 2. Start near the middle of the wire and wrap it around your arm. Keeping the coils tight and close together will make the armband sturdier. 3. Wrap the wire as many times as desired, stopping in the middle of the arm. Use needle-nose pliers to bend the top wire upward at a 90-degree angle and the bottom wire downward. 4. Slide the coil off your arm and bend the wires into any designs you desire. 5. Once finished, curl the ends by gripping the tips of the wires with the needle-nose pliers turning your wrist to create a tight loop. 6. Using your thumb, push the wire around the loop so that the wires touch to help prevent cuts and snags from the open wires. 7. 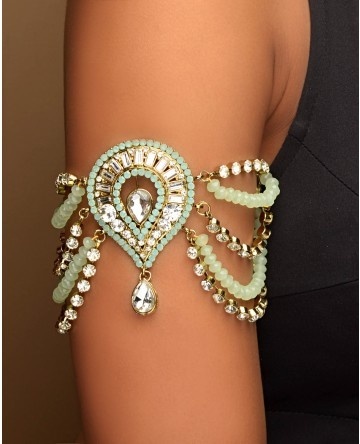 To decorate further you can incorporate beads into the band, creating a more interesting look. There are so many more ways to create your own armbands. Take some of the basic ones described here and make it your own. Added decorations can include anything from tassels, to beads and sequins. Be creative and see what beautiful armbands can be produced. This contribution comes from TheRibbonRetreat.com. They supply many types and styles of ribbon and fabric for crafts for all shapes and sizes.